Monster Heaven is…kind of ambiguous and fairly anonymous. On purpose. I will leave it at that. 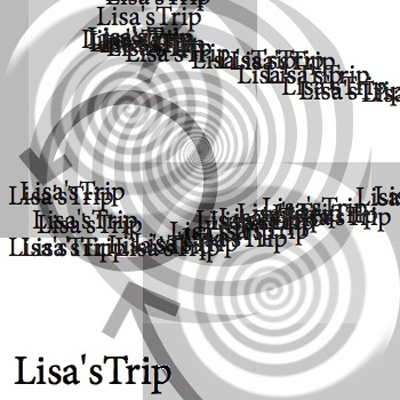 Lisa’s Trip is a project you’ve likely not heard of just yet, but I am certain you’ve heard the likes of it’s creator’s project REGOSPHERE, or perhaps the affiliated label, DUMPSTERSCORE HOME RECORDINGS. Andrew Quitter is behind this material, and his game this time is bleak, melting, bending and totally strange. The album title is fitting. I am not sure who Lisa is, but it’s definitely a trip. There is nothing Regosphere about this, so do not expect Quitter’s usual. This is a project based solely around a modified walkman and tape loops. 4 tracks make up this release, and it is full of dark and blurry looping and walkman play doused in (varying types of stereo) delay (I think?). The tape manipulation-based nature of these sounds is obvious. Tape warble, tape speed alterations, etc. Often times I hear about tape-manipulation providing the core of an artist’s piece, and it can be hard to tell due to the methods of processing. The tape-like sound is out in the open on this release, and I like that. You could almost file this under ambient. Amongst the sharp jabs of the rewind/fast-forward buttons, pieces of garbled voices, smooth and watery rumbling, broken beats and percussive elements, there is almost always an underlying soundscape providing the backbone of the piece. Have you heard Space Cactus’s “2001: A Space Cactus?” Label unknown to me. Or perhaps the “Aisling Sistrunk” tape on Cylindrical Habitat Modules? This is comparable in style and sound. On to the complaints. I don’t think a low-fidelity recording is necessary to make a noise release get it’s point across. However, for a tape-noise release of this mood and style, the crystal clear and almost tape hiss-less nature of the pieces slightly bother me. I just wish that, with all the material still in tact, this sounded dirtier somehow. I think it would really add to, rather than take away from, the slimy, smooth, cloudy vibe that these pieces give off. I am content with this release’s lack of harshness, so it’s not the overdriven signal I am looking for. I don’t know if the word “over-produced” is relevant here because that is usually used when talking trash about pop music. But with how bleak, weird, deformed and mysterious these slabs of sound are, I believe those characteristics could have been enhanced with some purposeful lower definition without actually degrading the quality of the sounds. Quality, however, is an arguable term, as we all know. On the subject of complaints, and back to my mentioning of the delay effect used on this release, I do think that this material could have still been superb as more raw and without so much processing. The delay effect fills the spaces and obscures the sounds (something many of us noise artists like to do with our source material). On the other hand, I think that at least one of these pieces would have been cooler, and even weirder sounding with less processing and with more bare-bones approach. Awkward silences and real hands-on personality can add a genuine touch to an album. It almost sounds silly typing out those sentences because I realize how hands-on these compositions must have been. I can imagine Andrew standing in his studio with this walkman, pressing on the tape, turning a few knobs, or whatever it was he was doing. But imagining what it would sound like without all the layering and effects could be really interesting and moving. Lastly, I will say that I adore and respect anything Andrew does, hands down. I do know, without having to ask, that the usage of effects and the way he composed the pieces, the direction in which those pieces move, and the fidelity and mastering were all intentional. I commend Andrew for manifesting what he intended to create, even with the element of surprise and unpredictability these kinds of recordings can have. Quitter is painfully good at what he does and knowing that makes me appreciate even the things I complained about. The physical copy, is limited to 50, and can be purchased at Monster Heaven. The special edition physical copies are limited to only 10, and each copy comes with actual physical tape loops that Andrew used. The art… I am not a fan of it at all. I understand that a particular style and subject was shot for, but it looks irritatingly amateur. I enjoy a lot of the “net-art” you can find on sites like Tumblr and Dump.fm, which this artwork sort of reminds me of, but this image, and especially the usage of text in particular, is just plain awful. Still, though, completely worth the purchase and/or listen.